From iconic city views to picture-perfect countryside, the Borders Railway Line offers plenty of opportunity for you to sit back, relax and enjoy the stunning vistas sweeping past your train window on one the great scenic rail journeys in Scotland. Travel through Edinburgh, Midlothian and the Scottish Borders and hop off at one of the 10 stops along the route to enjoy a fun adventure with all the family. Step off the train at Waverley Station in the beating heart of Edinburgh and pay a visit to the world-famous Edinburgh Castle. Travel to the National Mining Museum Scotland in Newtongrange Midlothian, and take the kids to experience what life was like for the coal miners in Scotland in days gone by. Or board the train to Tweedbank in the Scottish Borders and explore Abbotsford House, the exquisite former home of the famous Scottish author Sir Walter Scott, which is just a leisurely 20 minute walk from the station. 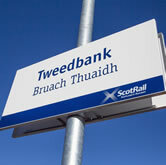 Let the new Borders Railway help you to explore these wonderful regions in full.